I am pleased to have my first ever guest blog post and is from author Dr. Susanne Breckwoldt! Dr. Susanne Breckwoldt is a clinical psychologist who has been in private practice since 1993 in Bergen County, New Jersey. The clip art picture of the vest is from Michelle at 3am teacher. Click the picture and give her some love! Thanks Michelle for designing the awesome vest! 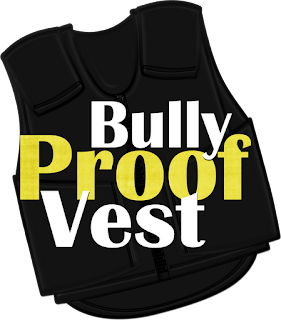 A "Bully Proof Vest,” once donned, giving the child full access to all of his inner resources and coping skills. He is instantly transformed into a superhero. The vest works like magic! Sometimes when a child gets scared, like when she dreads going to school the next day out of fear of encountering the worst school bully, she may, for a quick moment, forget that she has access to that special vest that will give her courage and determination. Parents or counselors help the child to fill in the SMARTS outline above teaching appropriate coping skills via educating the child as to the psychological make-up of a bully (e.g., "A bully does not have the same structure, love and support at home as you do.") In this way, the child does not feel personally targeted but can learn to understand that bullies have a limited repertoire of social skills and are thus unable to connect with peers in a friendly, empathic manner. The bully is just acting according to her nature. Many bullies grow up in households that model and even reward aggressive behavior. A bully's self-confidence is artificially boosted as he taunts a classmate perceived as being weaker than himself. One of the most important things for a child who is being targeted to know is that they do not have to deal with the bullying on their own. Each child, target or not, should be taught that in the event of actual or suspected bullying, the first order of business is to inform a responsible adult. A parent or teacher will take action to ensure the child's safety. for parents to reassure the child that they will provide safety and support under all circumstances. A child who has experienced bullying can be taught to stand up to the bully. This should not be confused with fighting back. Fighting back could exacerbate the situation, putting the target at even greater risk. The child can be coached to walk up to the bully and state in a firm way: "I want you to stop the bullying!" The child is advised not to make eye contact with the bully so as not to give the bully the chance to engage. Next, the child is instructed to walk away. A bully who sees that he no longer elicits fear will tend to lose interest in his target. Resilience is included to remind the child that he is capable, talented, fun or creative; that he is a member of a loving family, a soccer player, a good friend, cub scout and karate student. A parent can sit with her child and help him to list all of his unique strengths. There are a number of tools that a child can acquire to include in her tool chest. Some are simple reminders to walk together with a few friends at recess or join a group activity so as not to give the bully any opportunities. In general, a child can be taught to avoid locations that bullies are apt to frequent. A child who may have previously walked to school accompanied by an older child who lives next door may prefer to be driven to school by his parent. Preparedness and prevention techniques should be individually identified and discussed. Parents should inform their child that they are working actively with the school to prevent further bullying and should describe to their child the steps that the principal and teachers are taking to protect him and to correct the bully's behavior. Schools have zero tolerance anti-bullying policies in place and do make students aware of what this means. child to brainstorm and assemble their special therapeutic tools. With younger children who are more concrete in their thinking it may help to work with them on designing a vest on paper or poster board or, work with an actual all-weather vest designated for this purpose. The parent can help the child to design or personalize her vest, adding appliqués that are affirming such as images of her favorite storybook hero. With older grade schoolers, it is advised to think of the vest as being invisible to others or virtual, invested with empowering coping skills so that a child does not become too attached to or dependent upon a physical object for support. Ideally the vest should serve as a metaphor for all of the innate strengths and acquired resources and skills available to the child. Thanks Dr. Sue for the wonderful guest author post! She has also donated 5 Craig Meets Dave books that I am excited to giveaway! Check back on my blog for the contest soon!!! "teaching appropriate coping skills via educating the child as to the psychological make-up of a bully (e.g., "A bully does not have the same structure, love and support at home as you do.") In this way, the child does not feel personally targeted but can learn to understand that bullies have a limited repertoire of social skills and are thus unable to connect with peers in a friendly, empathic manner. The bully is just acting according to her nature." My issues are A) the perception that "bullies" (I hate that dehumanizing label) suffer from low self esteem or have poor social skills was debunked a long time ago; and B) I don't think that encouraging a child to feel better about herself by thinking negative things about someone else is either healthy or helpful. Also the idea that once the child tells, she can sit back and let the adults deal with it (as if zero tolerance policies are the least bit effective---they aren't) bothers me. You're teaching the kid all these great coping skills, but still telling her that the situation is too tough for her to deal with. If there's actual physical harm, then yes. If it's name-calling, then no. Let her use her new tools so she can gain confidence in her own ability to handle problems.